Glass artist Beverly Skinner fuses colored pieces of glass to create a flower-filled summer meadow scene. Bursting with cheerful colors, glass artist Beverly Skinner’s lustrous meadow sculpture is so delightfully summery that it’s more than a work of art—it’s a mood booster. In her home studio, Beverly builds blue-petaled flowers, pink heather, and a multi-colored meadow of broken and ground glass. She then heats it twice in her kiln, once to fuse clear glass and again to give it a wavy, free-standing shape. On the dining table or in front of a window with the light shining through, it’s like a glowing field of happiness. Handmade in Battle Ground, Indiana. Living and working in Battle Ground, Indiana, she's surrounded by lush nature. “I use a great deal of clear glass in my designs to welcome the outside in, instead of walling it out,” she says.” What else inspires her? “It sounds so simple, almost too simple, but my work makes people smile, and I am absolutely goofy in love with making people smile. How’s that for a formal artist’s statement?” she asks. Dust with a dry cloth or hand wash with warm water if necessary. I really do love this piece of artwork, the craftsmanship is excellent and use of color and design goes together extremely well. 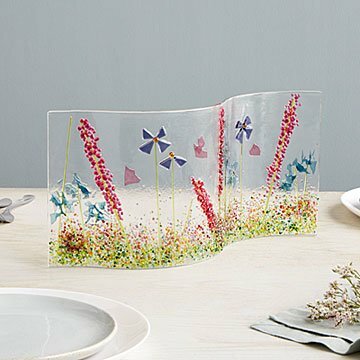 This Wildflower Glass Centerpiece is beautiful! The wild flower design in the glass is perfect and the design of the wave of the glass adds to making it a lovely centerpiece.